Looking through the photographs held at the Central Library I came across a truly interesting image. From the 15th to the 21st October 1945 Manchester played host to an event, largely ignored at the time, which would have huge significance for the future of an entire continent. It was at Chorlton-on-Medlock Town Hall that 90 delegates from across Africa, Europe and North America came together to hold the Fifth Pan-African Congress to discuss the future of Africa. 1945 was a momentous year in world history, the Second World War had ended the previous month and many of Europes’ colonies looked towards the prospect of finally gaining independence as a reward for their immense sacrifices. Pan Africanism was a political ideology developed by African intellectuals to challenge the artificial division of the African continent by the Colonial powers when they had scrambled for territory. Its ultimate goal was to unite Africa and gain complete independence. Originally planned to take place in Paris the conference was switched to Manchester because of travel problems. 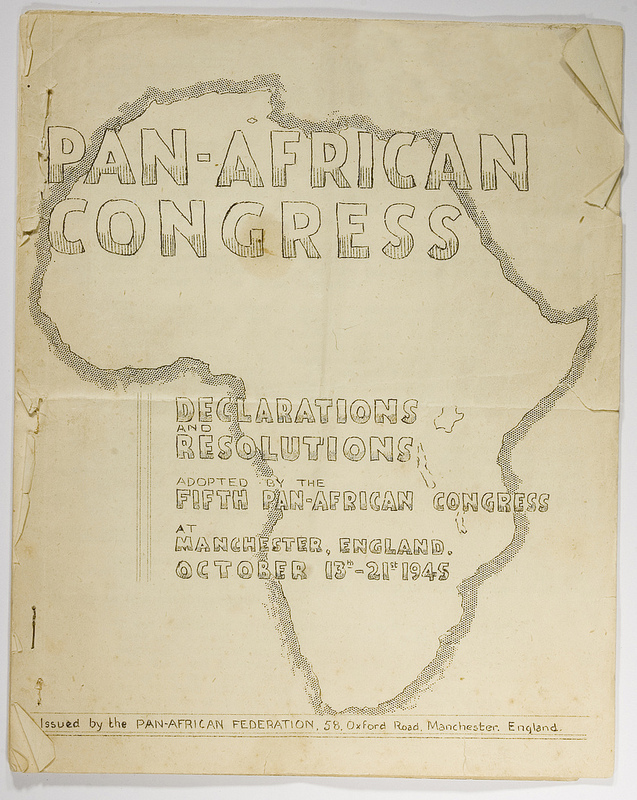 The Congress was organised by leading Pan African figures, George Padmore, a Trinidadian London based activist, Ras T Makonnen a Guyanese resident in Manchester, and other members of the International African Service Bureau/Pan-African Federation. Kwame Nkrumah, future president of an independent Ghana, who had arrived recently in England from the USA, was enlisted to help. Also in attendance was Jomo Kenyatta an independence activist who would go onto to become the first president of Kenya. Special honour was reserved for the 77 year old American civil rights campaigner W. E. B. Du Bois who had organised the Congress meeting in 1919. Searching through the libraries archives, particularly the documents held by the Ahmed Iqbal Ullah Race Relation Resource Centre, I came across a copy of the actual manifesto that was written by the Congress. In it were calls of “colonial and subject peoples of the world unite” and a declaration that “we are determined to be free”. During the conference many resolutions were passed on a variety of different issues. Politically, the Congress opposed the political oppression of Africa’s peoples and the denial of a say in their countries futures. Economically, the Congress demanded an end to the exploitation of Africa’s natural resources which made European powers rich at the expense of Africa. The Congress also railed against the discriminatory practices that were enforced in the colonies such as Kipande in Kenya, where Kenyans were forced to wear identification boxes around their necks and had their movement restricted. 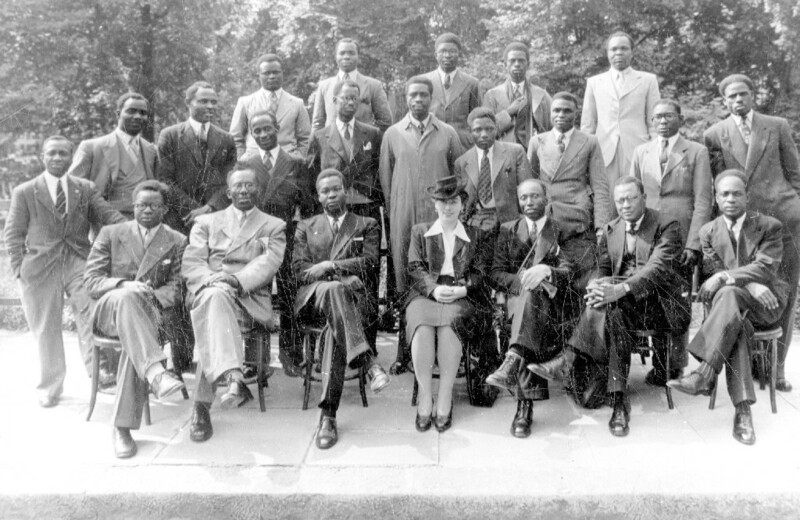 The meeting also included discussions on the movement for civil rights by African-Americans and an open letter was drawn up, addressed to the recently elected Labour Prime minister Clement Atlee congratulating him on the victory of the Labour party and calling on his government to take a stand against imperialism. “To condemn the imperialism of Germany, Japan and Italy while condoning that of Britain would be more than dishonest, it would be a betrayal of the sacrifices and sufferings and the toil and sweat of the common people of this country. All imperialism is evil”. Although the importance of the conference was not understood by politicians and the media of the time, in a few short years many of its participants would go on to put into practice what they had first declared at the meeting. In the twenty years that followed, most of Africa had achieved its goal of becoming independent however the dream of a unified continent ultimately failed to be realised.